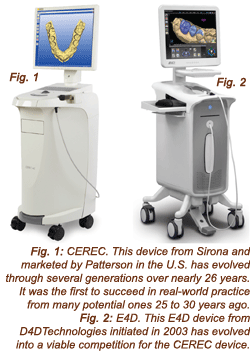 Twenty-five years have passed since the CEREC system from Sirona was in its initial developmental stages (Fig. 1). Many similar ideas and devices have come and gone before and after CEREC came onto the scene. Only one, other than CEREC, has been successful enough to still be on the market, the E4D Dentist Chairside CAD/CAM System from D4D Technologies (Fig. 2). In the United States, Patterson has the sales and service responsibility for the CEREC, and Henry Schein has the sales and service responsibility for the E4D. When the air turbine handpiece came into the profession in the late 1950s, almost all restorative dentists purchased them within a few years of their introduction. Similarly, when rootform implants were proven, almost all oral surgeons and later some periodontists, prosthodontists and general dentists implemented them into practice. It appears that the in-office milling concept is similar in its potential to facilitate restorative dentistry. Why has it not had the same acceptance and growth as other concepts? It is estimated that about 12,000 in-office milling devices have been sold to dentists in the U.S. from the two companies, the major share of which are the CEREC, primarily due to their head start. There are about 140,000 general dentists and prosthodontists in the U.S., which indicates that less than 10 percent of the potential restorative dentists have chairside CAD/CAM devices. Are all of those dentists using their CERECs or E4Ds? That is impossible to determine. A few in-office design and milling systems can be found for sale on the Internet for unknown reasons. 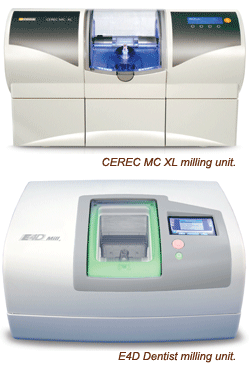 Some are older models of CEREC that are probably being replaced with newer technology. However, it has been our observation that a few dentists do not find the concept compatible with their practices. The frustrating fact to both of us is that we know from both research and practice experience that the in-office CAD/CAM concept works well, and that it can be financially feasible in a busy restorative or prosthodontic practice. After significant experience, the concept can be used for quadrants and even full arch and implant restorations. Many studies have supported the use of chairside design and milling systems. The references in the following list contain articles supporting the concept and show positive research on the devices.1-15 Implementation of the system takes time, planning, teamwork, willingness and patience to learn. 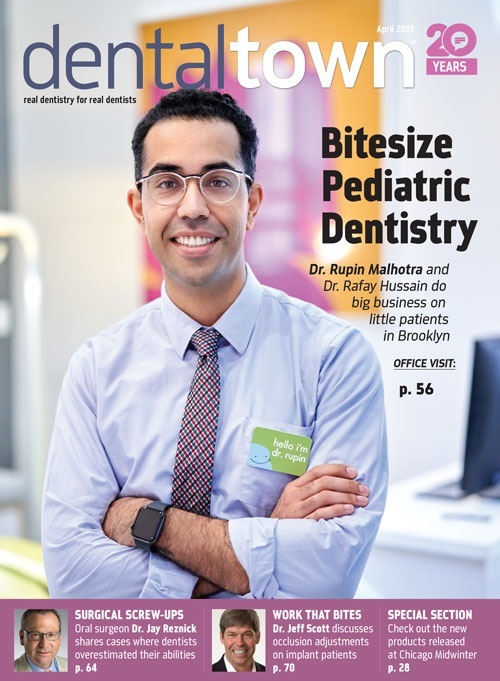 The purpose of this article is to identify and discuss the potential reasons that have impeded the in-office milling concept from being incorporated into more practices and to make suggestions for practitioners, distributors and manufacturers to make the concept more desirable and useful for dentists. The apparent negative points will be presented in the following manner. Each concept will state the identified item followed by potential solutions to that complaint. Currently, both systems and accessories require an initial outlay of about $130,000. This amount is a significant impediment for dentists, in spite of financing and the assurance that increased revenue will come into their practices. Before the recession, the initial cost was not as formidable as it has been during the last two years, but numerous surveys have shown that many dentists have refrained from such large capital expenditures during the "great recession." Each of the companies selling in-office milling systems requires a payment of about $2,600 per month. Obviously, that payment is present in spite of the practitioner's potential health challenges, vacations, a down economy or a scarcity of patients. This amount is not much less than the annual net revenue of a typical general dentist. However, the dentist has greatly reduced laboratory fees, and the financial needs can be met with an average amount of restorative treatment in a typical practice. Potential solution: Cost has been a major impediment for many dentists. This is a challenge only solvable by the manufacturers and the distributors of the devices. The companies have put enormous amounts of money into developing CAD/CAM technology for in-office milling. That investment must be recovered. That goal has undoubtedly been accomplished by the original device (CEREC), but time will probably be required for the newcomer (E4D) to do so. Additionally, there is ongoing research needed for each company to update and modify software and hardware as the concept continues to evolve. The distributors who sell and service the devices need to make a profit also. Only the respective companies can know when it will be possible to reduce the cost of the devices. One potential for reduction is to put the same concept into a simplified and less expensive delivery systems to lower cost, which we will discuss later. However, it is well-known that, in spite of relatively palatable lease payments, the overall investment required to introduce this concept into practice causes concern for most typical practitioners. The real solution to this challenge appears to be to reduce the manufacturing cost of the systems and pass those savings on to clinicians. Other similar "expensive" technologies are experiencing rapid growth due to decreased cost, such as diode lasers and cone beam CT imaging. In spite of some devout in-office milling users, key opinion leaders and sales representatives assuring potential customers about the usefulness of the concept, many dentists are fearful of the unknown challenges they will face. There are numerous factors contributing to that fear. Included are: anxiety about how the concept will fit into their practices, the chance of unpredictable ill health and lack of income, age and the thought of retirement, the extreme debt (upward of $200,000) of young graduates, the real possibility of further and prolonged economic recession, various family challenges requiring more financial resources, inability to determine the real increased revenue that the concept will build into practice, and the knowledge that the monthly payment continues in spite of the potential described problems. Potential solution: If fear is an impediment for you, might we suggest you meet with a user of in-office CAD/CAM to observe a clinical demonstration and a testimonial of how this concept is working in his or her practice? The Henry Schein or Patterson dealers will be pleased to provide names of users for you to contact and observe. When contacting these users ask in-depth questions to determine if the concept will fit into your practice environment. Distributors will often bring a system into your office for a demonstration to allow you to see how it works in your practice. In our observation, satisfaction with the concept ranges from extremely positive acceptance to dissatisfaction and selling the devices on the Internet. Only you can see if this concept meets your needs and desires for your specific practice. The majority of in-office milling unit owners really like their devices and enjoy having them in their practices. But some disgruntled purchasers and non-users who are satisfied with their conventional methods loudly proclaim that the concept did not or will not fit their practice needs and that they will not use in-office milling. These few negative practitioners often make potential owners wary and afraid to purchase the devices. Potential solution: Do you include all of the new technologies or materials into your practice, and do you like all of the concepts you have elected to put into your practice? Quite obviously, you do not do so. Similarly, not all purchasers of in-office CAD/CAM love their devices. Because they cost so much, their resentment is voiced more actively. As already suggested, please connect with someone who had the concept fit well into their practice. Take the time to see how they made the transition from conventional dentistry to use of in-office design and milling systems. Identify whether you have similar characteristics present in your practice that ensure success with the concept, such as high restorative need, competent computer ability, etc. Potential buyers become discouraged when looking at the number of devices sold to date compared to the general population of dentists… thinking that it would have sold better if it were any good. However, the market penetration is quite good when one considers that many practices with more than one dentist have only one device, that the concept is expensive and that it is relatively new technology. Potential solution: This challenge has no real solution other than to have all of the potential solutions stated in this article implemented by manufacturers, distributors and practitioners. The implementation of all of them would undoubtedly make the concept more desirable to practitioners and lead to more sales. It is well known that any new concept starts out as an unknown and grows into a commonly used object. Examples are automobiles, PCs, radios, TV, etc. The concepts must become faster, easier, better and less expensive to become commonly used. Additionally some dentists do not have interest in any dental laboratory work and reject the concept on that basis. When a practice is organized, running smoothly and producing adequate revenue, there is a tendency among some dentists to reject anything that would decrease the stability of the practice routine. Change is difficult, but change can be stimulating and will bring a level of self-confidence and new enthusiasm for dentistry. Incorporating in-office milling into a practice usually involves educating dentists to delegate some of the procedure to qualified staff members. Potential solution: If this concept sounds interesting to you, and you have investigated it thoroughly, changing your practice routine will be exciting and refreshing to you. We have seen mature practitioners who were relatively "burned out" with practice become excited about dentistry again. Changing a practice routine is a formidable thought until you determine that you will "re-invent" yourself again. We do not mean to downplay the needed organization and thought that must go into this scheduling change. It will take some time to do so, but the result will be satisfying to you and your staff. As expressed to us from potential purchasers, there is some frustration that both companies have large-wheeled, cart-type devices that contain the necessary computer, the monitor, the imaging handpiece, as well as other necessary devices. Many offices, especially the older ones, do not have adequate space to house the wheeled carts without compromising their already crowded operatories. Additionally, significant space must be found to locate the milling device, which is also very large and heavy. Potential solution: Their size can certainly be disagreeable and obtrusive in small offices. There are too many large objects already in treatment rooms. We have talked with the representatives of the two companies about this challenge. In our opinion, the large size problem must be overcome to make the concept more acceptable to practitioners. Changing the cameras to smaller sizes, changing the "cart" concept to a simple laptop or other small package, and making the milling devices smaller and lighter weight would greatly facilitate their acceptance into typical restorative/prosthodontic practices. However, the above suggestions pose significant technical and manufacturing challenges. Some dentists do not delegate many clinical procedures. They do almost all of the clinical procedures themselves. Average practices have two assistants. One of the best ways to make the in-office milling concept financially acceptable is to delegate a significant portion of the procedure to other qualified staff persons. Such dentists must change their overall staff delegation policies to facilitate more staff delegation or they must raise their fees allowing them to spend a longer time making the restorations. A well-organized office in which staff delegation is accomplished can make the in-office milling concept very effective and efficient. A practitioner that rarely delegates must change his or her delegation of procedures for optimum efficiency and acceptable revenue production. Programs are available to train staff persons to use the systems and to gain proficiency. Potential solution: Do you delegate some or many clinical responsibilities to staff? If so, the incorporation of in-office milling will be a pleasure for you. If you do not delegate many clinical tasks to staff, you will find a significant change in your practice routine to have staff persons accomplish some of the in-office digital impression procedures, design and milling. If you elect to do all of the imaging and milling yourself, the concept is not as financially acceptable as when you delegate much of the imaging and milling tasks to staff, while you concentrate primarily on tooth preparation and seating the restorations. Delegating to dental assistants, dental hygienists or other staff persons builds a sense of responsibility, self-esteem, trust and teamwork. When they take on these new responsibilities they appreciate your trust in them and they appreciate the opportunity to expand their value to the practice. Some technicians and ceramists are concerned that the dentist's total number of indirect restorations will no longer be coming to the laboratory. But when laboratory technicians and ceramists learn that only some of the indirect restorations will be milled using an in-office milling device, and that some of them might have data sent to the lab for milling, they are less frustrated. Potential solution: Most dentists using in-office milling make primarily posterior crowns and onlays. Some progress on to more complicated and less frequently needed restorations. Therefore, there is still need for laboratory technicians and this will always be so. Additionally, some practices actually grow the amount of both their conventional and CAD/CAM restorative dentistry when incorporating CAD/CAM. Frankly, as the concept continues to grow in popularity, the growth will be slow and steady, not fast, thereby allowing your technicians to accommodate the needed change. Many dentists become more interested in the laboratory concepts in dentistry as they use the devices. In the U.S., most patients want and/or demand tooth-colored restorations. Although many dentists favor metal restorations, because of their proven longevity, these are not done with the in-office milling devices currently in the U.S. Therefore, dentists going into CAD/CAM milling in their offices feel compelled to use tooth-colored ceramic or polymer restorations, the most popular of which are currently the ceramic IPS e.max CAD, lithium disilicate or VITA Mark II Blocs. This orientation is uncomfortable for some dentists. Many worry about the all-ceramic restorations produced by the in-office milling machines regarding their quality and the amount of time they will last. Potential solution: Clinicians Report (previously CRA) staff have been working with this concept for about 23 years. The ceramic and polymer restorations made with in-office milling have served in this time period as well as or better than laboratory restorations made with similar materials. However, it is well known and reported in the scientific literature that cast gold alloy restorations have the longest service potential of all restorations. You know well that very few patients want to display metal in their mouths in spite of the known greater longevity to be expected. In-office milled tooth-colored restorations placed properly are serving very well. It has been proven that in-office milling systems for dental restorations are highly useful, functional and financially feasible for many practices. The restorations made with the CEREC and E4D devices are serving as well as or better than restorations made by conventional laboratory procedures. There are numerous reasons why these systems have not made more market penetration – which have been detailed and discussed above. It is our hope that manufacturers, distributors and practitioners will work together to find ways to further implement this technology into the mainstream of restorative practice. Fasbinder DJ. Clinical performance of Chairside CAD/CAM restorations. J Am Dent Assoc 2006 Sep; 137 Suppl: 22S-31S. Isenberg BP, Essig ME, Leinfelder KF. Three-year clinical evaluation of CAD/CAM restorations. J of Esth and Rest Dent 1992. 4 (5): 173-176. Reich S, Wichmann M, Nkenke E, Proeschel P. Clinical fit of all-ceramic three-unit fixed partial dentures, generated with three different CAD/CAM systems. Eur J Oral Sci. 2005 Apr; 113 (2): 174-9. Bindl A. Mormann WH. Marginal and internal fit of all-ceramic CAD/CAM crown-copings on chamfer preparations. J Oral Rehabil 2005 June; 32 (6): 441-7. Nakamura T, Tanaka H, Kinuta S, Akao T, Okamoto K, Wakabayashi K, Yatani H. In vitro study on marginal and internal fit of CAD/CAM all-ceramic crowns. Dent Mater J 2005 Sep: 24 (3): 456-9. Tsitrou EA, Northeast SE, van Noort R. Evaluation of the marginal fit of three margin designs of resin composite crowns using CAD/CAM. J Dent 2007 Jan; 35 (1): 68-73. Epub 2006 Jun 15. Christensen GJ. In-office CAD/CAM milling of restorations – the future? J Am Dent Assoc 2008; 139 (1): 83-5. Clinicians Report. Performance evaluation of chairside CAD/CAM milling units. Oct 2009. Clinicians Report. Making in-office CAD/CAM work for your practice. June 2009. Christensen GJ. Successful use of in-office CAD/CAM in a typical practice. J Am Dent Assoc. 2008 Sep; 139 (9) 1257-60. CHRISTENSEN GJ. Is now the time to purchase an in-office CAD/CAM device? J Am Dent Assoc 2006; 137: 235-8. CHRISTENSEN, G.J. The Future Significance of CAD/CAM for Dentistry. State of the Art of CAD/CAM Restorations – 20 Years of CEREC. Werner H. Mormann, Quintessenz pg 19-28. May 2006.